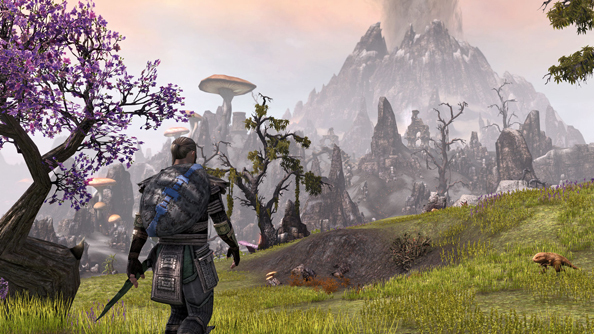 Good news: The Elder Scrolls Online is, by some distance, the Elder Scrollsiest of all the MMOs. But that’s not the whole story. 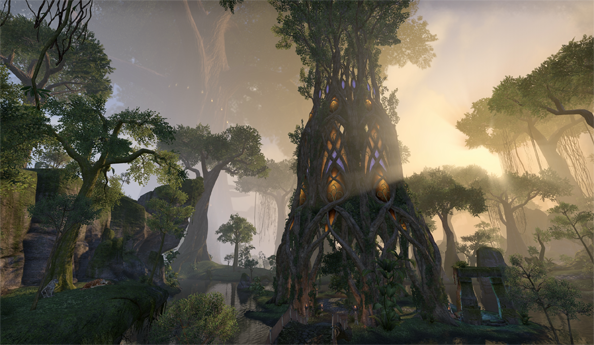 Jules, Nick and Jeremy pottered about nu-Tamriel’s green fields and brown wastes for a few days, and have returned veritable loremasters – ready to tell the tale of beta ESO, as I think we now call it. A world at once familiar and compromised. And narrated by a bored Dumbledore. Tim: First of all, let’s talk a bit about your characters. What characters did you pick, and why? What kind of build are you aiming for. Nick: In all of my Elder Scrolls games I always run one of two character archetypes: a stealthy dagger-wielding Khajiit or a Wood Elf whose main focus is archery but isn’t afraid to pull out a sword or dabble in magic if the situation calls for it. I went with the latter this time around, thinking it would give me a good taste of all the three. I picked up the Nightblade class, without giving it too much thought. It had a lot of stealthy elements to it and that’s right up my street. Further into the game however, I took a bit of a different approach. In the Nightblade skill tree you can learn Siphoning: a magic centric ability that drains the life from your foes while boosting your own. It was a great way to use all that abundant magika that my bow attacks ignored. Julian: I went for an Argonian Sorcerer. In past games I’ve usually gone for a similar build to Nick but I wanted to try out ESO’s spellcasting. I particularly wanted to see how they’d managed to condense all the different magic specialities of the other Elder Scrolls games – Destruction, Conjuring, Illusion, etc – into a single class. I was hoping to create a spellcaster who was more of a support role than a fighter and Zenimax have largely allowed me to do that. Though, with so much solo content, I couldn’t escape from damage dealing entirely. Jeremy: I played a middle-aged orc lady with an eyepatch, because there aren’t many of those. And I went with the Nightblade. Like Terry Pratchett, I’ve always played the Elder Scrolls as if it’s Thief, and wanted to know whether any of the now-sophisticated stealth mechanics of the main series had transferred over. We’ll get to that. 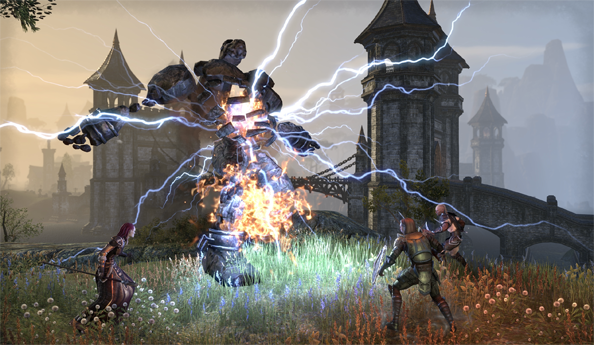 Tim: ESO doesn’t have strict character classes. How free did you feel in picking your traits and abilities? Nick: Earlier I said I picked up the Nightblade class without much thought. Well that is where I clearly underestimated the freedom of choice in ESO. While I was adventuring I was always studying my fellow players and their playstyle. Another Wood Elf was using a bow similar to me, but he had a Daedric Clannfear following him around. It looked natural considering most other MMOs give pets to a bow wielding class, but he had gotten his pet from the Sorcerer class. I also saw a High Elf running around in full heavy armour, while shooting fireballs and lightning from her staff. That’s the magic you see: you might pick a class, but you are truly free to pick what tools to supplement it with. I might have been using a bow and medium armour, but I could easily train up my destruction staff and light armour, while using my Siphoning magic to become a full blown magic user. Julian: As Nick says, the freedom of play is what’s most immediately noticeable. I had my sorcerer kitted out in heavy armour, wielding a restoration staff, and a summoned Clannfear as a companion. Because your abilities aren’t only linked to what class you pick but also what items you have equipped, all my healing spells came from my staff, not from the fact I was a sorcerer. I don’t play a great many MMOs and hadn’t experienced anything quite like it in other games. though I’ve heard that Guild Wars 2 has a similar equipment/ability system. Jeremy: You are your equipment. Not quite so overtly as in Guild Wars, which does the levelling right there in your quickbar – but when it comes to assigning skill points, you’ll find your choices have been quietly moulded according to your playstyle. You’re then given meaningful options about how you use those skills via various sets of abilities – which can relate to your weapon, armour type, class, race and a host of other stuff. I’ve upgraded my bow and some nasty assassination abilities in tandem, and developed a snipe ‘n’ shank hotkey sequence that’s already deliciously satisfying in that way MMO combat routines can be. Death comes quickly when I can’t get a stab in fast enough, and the vulnerability of a stamina-high, health-low build continues to appeal. Tim: Can you talk me through your experiences of the opening area? Julian: Did anyone else think the Oblivion prison was a bit naff? Basically, all players start life in this fire and brimstone prison run by a Daedric Prince called Malog Bal. You wake up in a cell in the middle of a prison riot and you break free with help from an ancient spirit going by the name of The Prophet and voiced by Michael “Dumbledore” Gambon. It was laughably dull for a prison riot. I was stood in a corridor chatting to a quest giver and watched as the same three NPCs casually jogged by in a loop. That was supposed to be hundreds of angry spirits fighting tooth and claw for their freedom from the Daedric realm. When you escape into the open there are a couple of Flame Atronachs stood looking nonplussed. 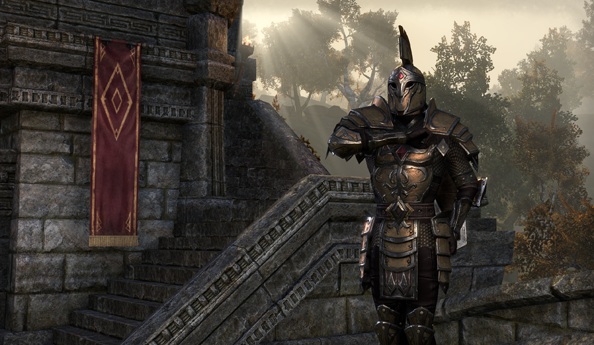 That’s the crack team of guards that have held Tamriel’s souls captive for millennia. Zenimax could have thrown you in at the deep end, surrounding you with confusing action and mini quests where you have to fight off pushes from the prison guards and help other prisoners arm themselves. Instead, you walk through a grey crater and press ‘E’ on a couple of levers. Jeremy: The prison sequence is atrocious, yes. The exposition was so ham-handed that I couldn’t heed Mike Prophet’s warnings if I tried. I was too busy being embarrassed, imagining what Gambon made of the made-up magic macguffins he was shouting about twice a line. John Cleese shows up five minutes later – and to his credit, you can’t actually hear him hang up the phone like you can Gambon. But it’s a terrible relief when you’re sent on to Tamriel. Your jail time is mercifully short, and from there the further you stray from the main quest, the sillier and thereby more entertaining the quests become; the more inventive the writing, and the more eccentric the personalities. Nick: If I could describe the opening in one word it would be “stiff”. It all felt very mechanical, almost as if it was constructed for the mere purpose to serve as a reason for you being soulless. I kind of missed the old style of opening where you picked your characters traits as you went along. It would’ve been a perfect opportunity for Zenimax to give you a taste of each class before committing to any one in particular. And who the hell thought it was a good idea to litter the final room of the prison with hundreds of openable pots? I had to open every damn one before proceeding out into the open world, because loot. Julian: There were a lot of empty crates. The game already feels sparse, filling it with empty containers doesn’t help. Nick: Once you’re out though, the grass is definitely greener. Since I was a Wood Elf I belonged to the Aldmeri Dominion, and so started in Summerset. The environment did a good job of showing off what the engine could do, and I was certainly pleased with what I saw. Best of all is there’s nothing stopping you from just going and exploring everything on the horizon. Tim: Does it feel like an Elder Scrolls game? Jeremy: That’s a deeply complicated question to answer – but it feels far Elder Scrollsier than it has any right to. I stepped off the ship in M’Blah’Yeah fully intending to play and judge ESO on its own merits as an MMO, rather than as Skyrim with Friends. But it goes far out of its way to invite the comparison. Everything from the first-person perspective (on by default, with third-person accessible with a roll of the mouse-wheel), through the closed-eye visibility meter, to the area-transition trapdoors – it’s all designed to recall Skyrim et al. Moment-to-moment, it sort of works. In Redguard land, at least, I can vouch that within minutes you’re opened up to the kind of exploration-driven questing we’ve become accustomed to in Elder Scrolls Proper. You’re distracted inch-by-inch from your intended path, until you find yourself on the wrong island, attempting to liberate a cold-turkey alcoholic from his own delusions and the goblin tribe he’s accidentally joined. Strip it of its name and interface trappings, and it’d still feel a little like a Bethesda jobbie. Which is fortunate, because nobody’s paying per month to watch an eye icon that reminds them of another game they’d prefer to be playing. Nick: The first-person perspective was a deal-breaker for me. I’m really glad they decided to put it in, but I can’t help but feel it’s just something that was crudely wedged in to please the fans. The FoV is horrible, almost to the point where I start to feel ill. It saddens me because there was a genuine, honest moment where a skeleton made me jump out of my chair when it ambushed me. I’ve never had that happen in any other MMO I’ve played. That aside, it’s actually hard to believe that Bethesda didn’t make this themselves. The characters and environment definitely gave me the feeling I was in an Elder Scrolls game. You could have easily walked in on me and thought I was playing Elder Scrolls VI. Jeremy: I should say I’ve had no problems with the first-person view, which I wouldn’t dare part with for fear of wrenching the game out of association with the unmalleable Elder Scrolls parts of my memory. But FOV is one of those horribly subjective issues that drifts blissfully on by one bugger and utterly ruins a game for the next. Julian: I went into third person almost as soon as I started playing. It felt way better than playing in first. The UI is a big help in making the game Elder Scrolls-y but the thing I thought brought it most in line was how quest givers aren’t all focused in a single spot and illuminated by exclamation marks. You will find quests by chatting to NPCs as you would in an Elder Scrolls game and you will find those NPCs all over the environment – not just in the villages. Besides that, though, I’m not as convinced as the others. Nick: The question for me isn’t if this game feels like an Elder Scrolls game, but if it’s a good MMO. 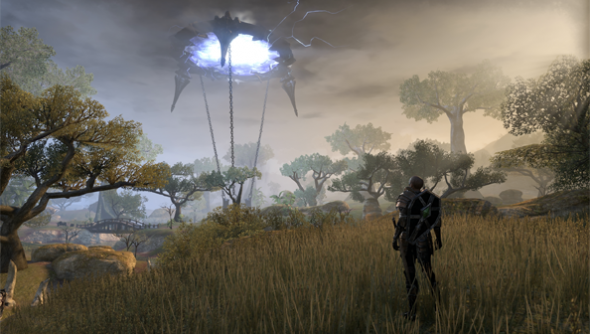 And more worrisome: if the MMO isn’t good, does it compromise that feeling? Julian: I’ve had a chat with Jeremy about this already and I think I might have picked the dud race. 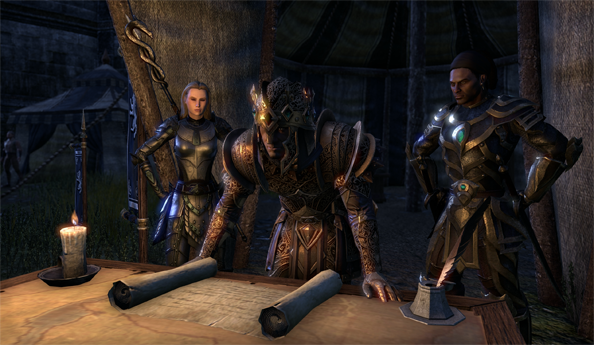 The Argonians are members of the Ebonheart Pact faction and start life in the kingdom of their allies, the Nords. I was not a fan of the quests at all. My main quest was to evacuate the island before it was attacked by the Aldmeri Dominion. That meant finding four villagers at the extremities of the island. One of those villagers wanted me to find three of her companions, another wanted me to find three sigils, another had me find their friend, and the final villager had me infiltrate a bandit camp to find three bits of evidence. Plus, at one point a stranger ran up to me and asked me to find three of her friends who had been turned into rats. It’s not that I didn’t enjoy all the killing and infiltrating but the structure of the quests was barely hidden at all. Bleakrock Isle coupled with the prison made for a really dull opening few hours. Nick: I’ve had a similar experience in my opening area as well. It becomes even more apparent when switching between your main quest and the side quests. The quality of writing dances around more than a Khajiit on skooma. My main quest has me working for the Queen under my mentor’s wing. He’s a wonderful Khajiit named Raz. His dialogue is funny and witty, while not detracting from the tasks he puts before me. I absolutely adore him and I’m more than looking forward to all our interactions. I’ve also had similar experiences with the quests and characters from the Fighters and Mages guild. Switch to the side quests which litter the area and they pale in comparison. Go talk to this guy. This guy wants you to talk to three other guys. Now go back to the first guy. Quest complete. Fetch quests still exist, loosely tied to a plot you care very little about. Some of these plots let you make a moral decisions. I was asked to investigate a tomb which had been recently spewing out undead onto the mainland. Turns out the undead were restless because an eager mage had stolen a precious artifact, unknowingly unleashing an evil spirit. After we figure out how to re-imprison it and stop the undead, it’s revealed that someone has to harbour the spirit and make the sacrificial choice to be sealed inside with it. Now I was given the choice of who, but I was dumbfounded. I had known both characters for less than ten minutes, I didn’t care. So I threw in the old guy, because he asked me to. Jeremy: The Daggerfall Covenant starting areas culminate in a decision that basically amounts to nuclear disarmament or deterrent. Your decision will alienate half of the vagabond crew who’ve accompanied you for the past couple of hours – the question is simply which half. That was the high point of a sprawling questline that had taken me through disguised infiltration, rock-hard bosses, and a brief platforming sequence, to fluctuating degrees of success. In general, though, I’ve approved of a tendency to make objectives points on the map rather than kills, and leave the approach up to the player. Tim: The game’s faced a pretty fierce reception so far. Do you think the criticisms are justified? Julian: Yes. I don’t think they’re all correct but I think when Zenimax decided to take a huge franchise like The Elder Scrolls, that’s been single player for two decades, and make it into an MMO, they need to show that it didn’t start life as a generic fantasy RPG that was then reskinned into a popular series as a cash grab. I am coming round to the game the longer I spend with it and the more distance I put between me and the opening quests of the game. That’s largely down to the skill system and the freedom I have in customising my character. The story hasn’t hooked me. Yet. Something else this beta hasn’t shown, oddly, is what it’s like to play with other players. There was barely anyone around and PvP wasn’t on show. It felt like playing an empty Elder Scrolls game. That’s something that may well change as the servers fill out. It was frustrating that Nick, Jeremy, and I weren’t able to play with each other because we’d all picked different factions. Nor would we ever be able to play with one another. I might have had a much better time if we’d played through the opening together. There are people who like to play as cats and there are people who like to play as lizards and never the two shall meet, thus spake Zenimax. Nick: That probably annoys me more than it should. I know it makes perfect sense lore-wise to separate these factions, they’re sworn enemies after all. But me and my friends – as Julian demonstrated – have a very diverse race preference. It’s a perfect example of where the tropes of an MMO conflict with the delicate nature of an Elder Scrolls game. I want to play this game with my friends, but I also want to keep my in-game persona that’s been going for over a decade. Jeremy: In the port town orcs start in, there’s a well with a bucket hanging above it – a little like that seen in Oblivion’s early demos, designed to demonstrate its then-groundbreaking physics. Fire into it, though, and you’ll receive no feedback – your arrow will pop out of existence upon contact. It’s not an important thing, by any stretch – but indicative of the level of environmental fidelity that Bethesda Softworks can create, and which Zenimax Online fail to mimic convincingly. Rendering every bottle, bowl and bee a hilarious physics object is, I’m aware, probably a technical impossibility in a massively-multiplayer environment. But I really miss it. Nick: Sneaking and stealth do feel a bit lacklustre. Most, if not all, of my quests that involved infiltrating someone’s house were all the same: either persuade or bribe the guard in front of the door and enter another copy and pasted interior. Now that I think of it, one house did have a broken window I could enter. Maybe these will be fleshed out once the Thieves Guild and the Dark Brotherhood are in the game, which unfortunately will be absent at launch. Until then, sneaking just feels like a cheap way to get a critical hit on an enemy from distance. And I have no clue how this will work in PvP, especially since people have access to a third-person perspective. Jeremy: Playing as a nightblade, the gulf between ESO’s stealth and Skyrim’s has been most apparent in its robot people. In Fallout 3, Bethesda’s over-reaching Radiant AI had evolved into something far subtler. Something which saw characters travel in packs across the land, reacting to threats and unexplained noises alike in convincing, dynamic manner. It was like playing Dishonored and FEAR at once. In ESO, by contrast, we’re returned to binaries. An enemy won’t search for a missing sneak – they’ll jump from life-endingly furious to oblivious and back again. Cross an invisible boundary a short distance from their patrol area, though, and they’ll return to their station, HP miraculously topped up. Why? Because that’s what MMO mobs do – they exist to be dutifully slaughtered by players, who might arrive at any time. 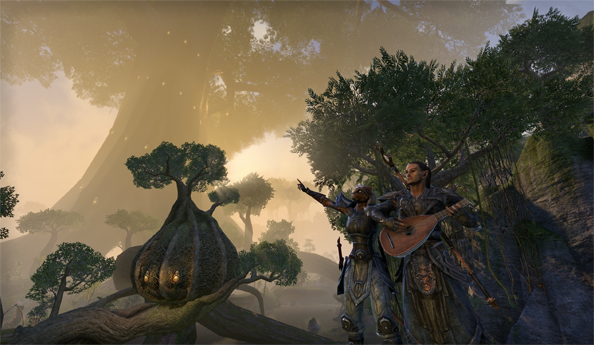 And at its worst, ESO feels not like a living world but a theme park built for us to enjoy together, but separately. Tim: How does it do for prettiness and scalability? 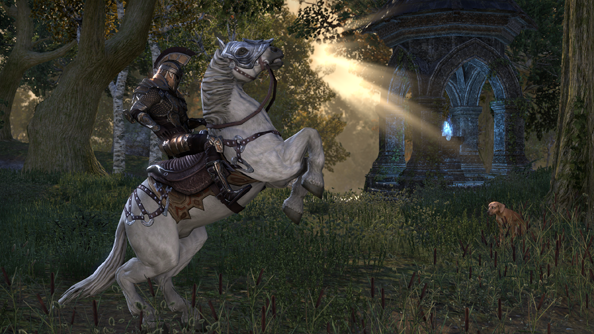 Julian: I’ve not had a chance to play ESO on my desktop yet. I think it’s in a box under a box inside another box in the car. On a laptop it doesn’t look so good, on a par with Morrowind (and not the really nicely modded Morrowind) but it does run. Having a 30GB MMO run on a thing I can fit in a cat is no small feat. The one big problem I’ve run into is environment load. If I go for a run into the wilds then objects around me don’t load until I come to a standstill. Sometimes that means a bit of foliage, other times it’s a bandit camp. I’ve been killed more than once because a set of tents and heavily armed brigands fade into view. Jeremy: I’ve had similar GTA III-like problems with invisible scenery on my own laptop. On my high-end machine, though – an Alienware X51 with a GTX 660 and i7-3770 – it’s reasonably pretty. It lacks the stellar art direction of Bethesda’s best, but musters similar feats in draw distance and remains convincing in close-up – even in first-person. 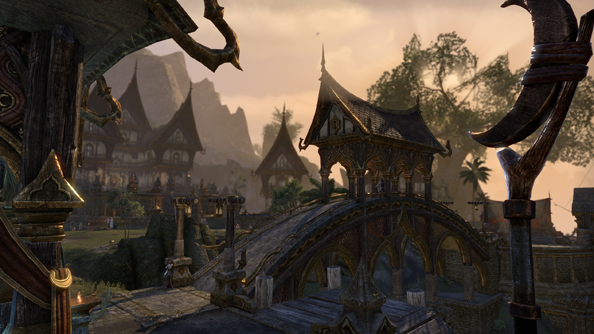 The scalability will certainly count in ESO’s favour – but there’s no doubt you lose the sense of scale and some of the wonder at the lower end. Nick: I played the game with everything turned to eleven. Having the draw distance at the maximum really helps achieve that feeling of huge, open areas. Some NPCs seem to have a few jagged edges, something I couldn’t remedy with a good dose of anti-aliasing. Apart from that though it ran at a smooth 60 FPS for all of my adventures. I’m running an i7-2600k at 4.6 GHZ, an MSI 580 GTX Lightning and 8GB of RAM. My biggest gripe was loading times. Sometimes I thought my game had crashed, only to be loaded in just before I killed the process via task manager. I don’t know if it’s a client side thing or a server side thing, but I would recommend putting ESO on an SSD if you have one spare. Tim: Do you want to continue playing it? Julian: I can see myself diving in for a few more hours but, at this point, there’s been nothing to convince me to subscribe. I’d like to see how the PvP pans out because that could be something that grips me. Jeremy: It’s a world compromised by its impermanence. And when Elder Scrolls players have become accustomed to making their mark, that’s a crime. Not a really bad one, like murder – something like tax evasion. And yet. Yesterday I bypassed a bunch of goblins via genuine sneakery, clambered to a precarious vantage point far above my goblin king target, and sniped him unawares. Minutes later, I escaped an enemy camp not by blasting my way out, but by taking a short walk off a tall cliff into the ocean and swimming back to shore. In no other MMO (bar Planetside, at a push) can one do anything of the sort. This may not be an online iteration of the Elder Scrolls series, in the strictest terms – but it is the Elder Scrollsiest of its genre by some distance. I’ll be heading back into Daggerfall tonight. Nick: I always give any MMO a good run for their money. I’m still sat firmly on the fence whether I would pay money for this game or not, something that might be qualmed the deeper I go. For me, I munch through most MMOs in a week after they launch. It’s what lies end-game that determines if I’ll be making ESO my home for the foreseeable future. I need tons of content to satisfy my hunger, and as little grind as possible. And with the high retail price and a subscription to match, my expectations are set very high.